Add Vodka and tonic water in ice-filled highball glass and stir. Garnish with lime wedge. 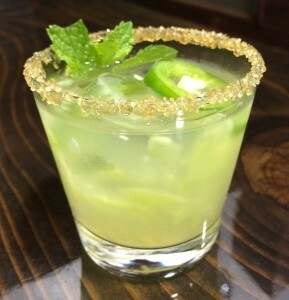 Place simple syrup, mint leaves, cucumber, jalapeno in sturdy glass and muddle. Add ice, vodka, lime juice and shake well. Strain into a martini glass that has been rimmed with raw sugar. Top with a splash of sparkling water. Place cucumber slices, basil leaves in a sturdy pint glass and muddle. Add vodka, lime juice and simple syrup and stir. Strain and pour into a glass that has a ½ rim of raw sugar filled with ice. Top with sparkling water. Garnish with cucumber slice. Fill glass with ice cubes. Pour vodka, cranberry juice, grapefruit juice and lime juice over ice, stir. Garnish with lime slice. Add Vodka, grapefruit juice and simple syrup in ice-filled highball glass, top with sparkling water and stir. Garnish with grapefruit slice. Place blackberries in a sturdy pint glass and muddle. Add vodka, lemon juice, simple syrup and ice, shake. Strain into a glass with ½ sugared rim filled with ice. Top with tonic water and stir. Garnish with a fresh blackberry. Place simple syrup, marjoram leaves and cherries in sturdy glass and muddle. Add ice, vodka, lime juice and shake well. Strain into a martini glass. Dip 1/2 rim of a serving glass in simple syrup and lightly dip in sugar. 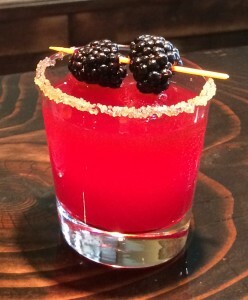 Muddle blackberries in the rimmed serving glass with a pinch of sugar, add Vodka, lime juice & cinnamon simple syrup. Gently muddle mint leaves in separate glass or mortar & pestle. Add ice to serving glass, add mint leaves, add soda, stir well (incorporate some blackberries to the top and some mint to bottom) add bitters and garnish with mint leaves & a blackberry. Garnish with mint leaves and blackberry. Dip 1/2 rim of a serving glass in simple syrup and lightly dip in sugar. Muddle strawberries in the rimmed serving glass with a pinch of sugar, add vodka, lime juice, and simple syrup. Gently muddle mint leaves in a separate glass or mortar & pestle. Add ice to serving glass, add mint leaves, add soda, stir well (incorporate some strawberries to the top and some mint to bottom). Garnish with mint leaves and a strawberry slice. Fill glass with ice cubes. Pour vodka, cranberry juice, apple cider over ice, stir. Garnish with apple slice. Gently muddle mint leaves in shaker, add other ingredients and shake with ice. Serve on the rocks with 2 mint leaves. *Watermelon Puree: Chop and blend watermelon. strain and discard pulp. Muddle fruit in shaker, add all ingredients (except soda), shake, strain over ice, add soda. Garnish with a couple of strawberry wheels, lemon wheel and or blueberries. Muddle cherries in shaker, add all ingredients (except soda), shake, strain over ice, add soda. Garnish with a couple of cherries and or lime wheel. Add vodka, lime juice and mint simple to an ice filled shaker, shake and strain into a Collins glass filled with fresh ice, top with club soda. Garnish with mint sprig and lime wheel. Mint Simple Syrup: Heat ½ cup water and ½ cup sugar in a small saucepan. Bring to a boil, then remove from heat, stir in about 15 torn fresh mint leaves and let cool and then strain. Store any unused portion in an airtight container in the refrigerator for up to 2 weeks.